Back In Love Again is Don Savant’s return to the place where he started. It is a journey that will help anyone that has lost love want it, find it and accept it once again. Be prepared to fall in love again. Don was born and raised in Spartanburg, SC. He was introduced to and fell in love with poetry in the 7th grade. He has since self published several collections of his own poetry as well as anthologies. He also has two collections that were released under a publishing contract. To Don, writing is the oxygen that fuels his existence. Book is available for purchase from www.lulu.com/donsavant, via my amazon author page at www.amazon.com/author/donsavant. You may also request that I send a signed copy by sending me an e-mail at don.savant@gmail.com. Payment will be accepted through paypal. “He’s done it again. That’s all I can say! An Awesome Author that many people over look. Don Savant is back with another Poetry slam! His books, his writing, his thoughts are never anything short than amazing. 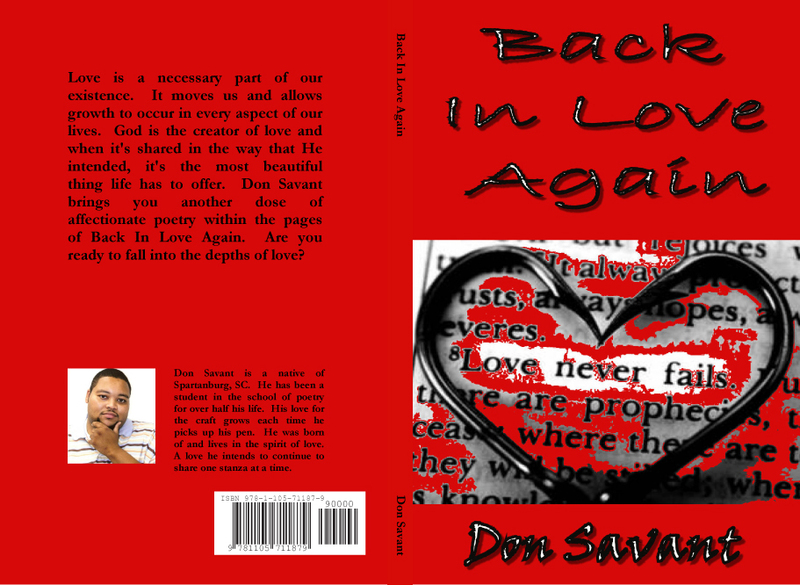 Never letting us forget about love, Don Savant is Back in Love Again. With breaks in the poetry like an intro “Message on Love’s Answering Machine” it’s flow is just like the creative of an Album from a songstress.